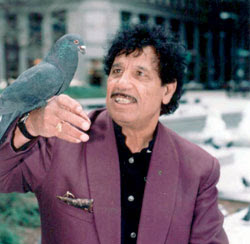 Saban Bajramovic (pictured above) was the king of Balkan Gypsy song, arguably the greatest Roma vocalist of all time (and a serious pigeon-fancier as well). This week I'll present two songs as evidence, one from 1969 and the other from one of his last recordings in 2006. No pigeons were harmed in the production of this radio show. Also this week: new music from Vieux Farka Toure (a cover of his father, in fact); some nice long songs from the Congo and Kenya; Dubmatix mashes up reggae, electronica and bass music; and as always, much more.